It is ready to take all the food lovers to a memorable experience through exceptional ambience, exclusive food and invincible service. Pearl Social offers a contemporary and innovative Mediterranean inspired menu, serving a selection of fresh seafood, grilled meats and small plates; perfect for a relaxed dinner with friends. 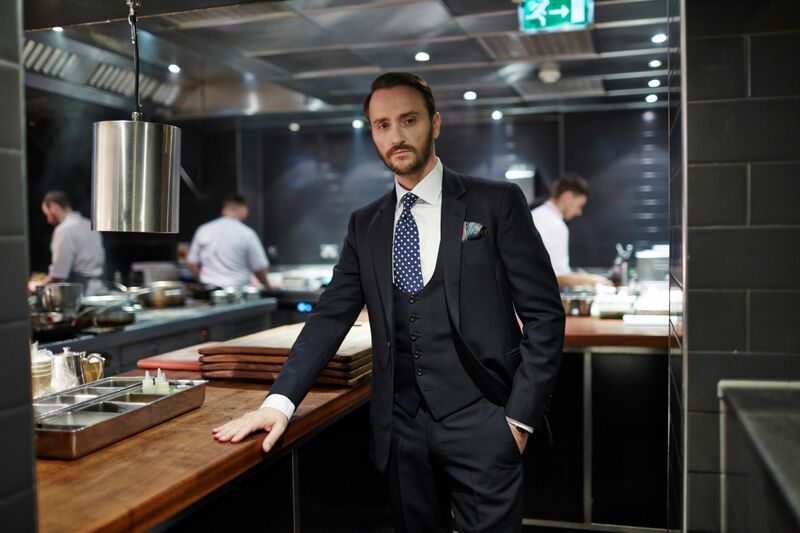 Globally renowned Michelin star chef and restaurateur, and one of England’s most prolific chefs, Jason Atherton has worked with the likes of Marco Pierre White and Gordon Ramsay before creating his own empire of restaurants which now totals 17 worldwide, including Pearl Social. Jason’s The Social Company has expanded at an impressive speed, however, with each restaurant opening, Jason is at the centre of the project, overseeing all aspects from recruitment to menus, ensuring each new opening is as successful as the last, “My ethos is to do better tomorrow than I did today. If you can do that every day you can’t help but succeed”. Jason’s passion has always been in making something special for someone and seeing them smile. As he fondly says, “When you love what you do, a lot of good things follow.” The same phenomenon has happened with his empire of global restaurants. Designed by Rosendale Design, the interiors possess a Mediterranean flair, with floor to ceiling windows showcasing the spectacular views of The Pearl. The contemporary art deco look is accentuated with gold details to create a luxurious space. There is bespoke leather seating throughout the 80-cover restaurant, with a series of 1960’s French Riviera-inspired pictures adorning the central wall. The 50 cover outside terrace creates the perfect spot to watch the sunset with family and friends. Discover Chef Jason Atherton’s culinary delights for yourself on March 24, 2019 as Jason visits Doha for Qatar International Food Festival. Enjoy an exclusive tasting menu and demonstration by Jason at Pearl Social. Dishes on the menu include charred leeks, potato, truffle, confit egg yolk, toasted hazelnuts, olive oil poached prawns, parmesan rice, 40-day dry aged Lake District beef fillet and cheek, aubergine and miso puree, garlic confit, Jason’s signature Bitter chocolate pavé, olive biscuit, and olive oil ice cream; to name a few. If you can’t make the tasting menu, head down to Pearl Social to sample their delicious Mediterranean menu curated by Jason Atherton from Tuesday to Sunday. Enjoy Brunch on the weekends, plus live music throughout the week. Pearl Social is guaranteed to be every foodie’s favorite new restaurant in Doha! For more information, visit www.pearlsocialdoha.com. For reservation, call at +974 4035 5300 or drop an email at reservations@pearlsocialdoha.com. By Molten Metal• 1 month 2 days ago. Excellent spot if you ask me , yea, really , No 1. Do you know enough about the Iron Chef - Masaharu Morimoto?